Time required: Regularly scheduled weekend liturgies (Arrive at least 15 minutes prior to the start of any liturgy/service). Meeting attendance one hour, quarterly. Special holiday liturgy practices, one hour. To instruct the children in preparation for the Sacrament of Reconciliation, Communion and Confirmation. Educate the children about the Church, Mass, Jesus, the Commandments, Sacraments and the Catholic faith. Assist and lead congregation in musical expression of worship and praise. Time required: 2 hours per week. Rehearsals – 1 evening a week 7:00 – 8:15. 11:00 am mass on Sunday. Participate in special celebrations, i.e., Christmas Eve, etc. Distribution of the Holy Eucharist to the faithful of the parish within the Mass as well to those who are unable to attend regularly scheduled liturgies due to illness or disability. Time required: Two regularly scheduled weekend Masses per month. Attend semi-annual meeting, one to two hours. To provide food items for families in town who are in need of this assistance. Time required: Three hours for 3 people and 8 hours for contact person (calling and picking up boxes). Holidays take a little longer. To make visits to people confined to their homes. You may be called upon to run small errands, provide companionship, or just sit and talk for a while. A community of women who support the parish spiritually and a time to share together. They offer many opportunities for the newcomer to meet other parishioners. Time Required: Monthly meeting for 1 hour, plus an additional 4 hours per year for activities. To help promote the spiritual and social well-being of the Parish by men and young men of the parish. 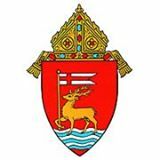 Support/promote religious activities of and for the men of the parish; support local civic and fraternal organizations and their causes and provide wholesome social activities and events for its members and the parish-at-large. To faithfully proclaim the Word of God within the context of the Mass or Scriptural Services. Time Required: Regularly scheduled weekend liturgy. (Arrive at least 15 minutes prior to the start of any liturgy/service). Attend semi-annual meeting, one to two hours. To inform and educate parishioners about respecting life from the moment of conception to natural death. Support pregnancy crisis centers, Carolyn’s Place (Waterbury) and Birthright (Ansonia). Collect donations of goods or monetary donations. To instruct the children in the Sacraments of Reconciliation, Communion and Confirmation and educate them about the Church, Mass, Jesus, the Commandments, Sacraments and the Catholic faith. Time required: 8-10 hours over the course of the school year. To facilitate the preparation of the adult and young adult for membership within the Roman Catholic Church. To help those seeking membership to grasp an understanding of the Lord and all aspects of the Sacramental Church which he founded. To prepare the Community of St. Michael to receive new members and assist them in their faith-journey toward full membership. To feed the hungry by supporting our local homeless shelter, Spooner House. Make 30-40 sandwiches once a month with a team comprised of 4-6 members. To support Parish organizations, attend group meetings and discussions to obtain a better understanding of the Gospel and its relationship to life today. To provide socialization and companionship for parishioners unable to participate in parish activities.